If you wish to get in touch, please send us an email. 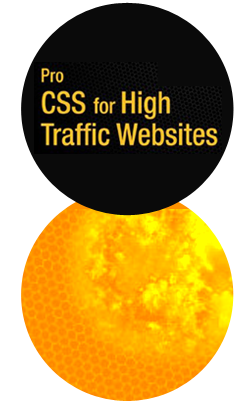 Available from Apress and published in mid-2011, this book explores the challenges of working in large teams, on websites that receive considerable traffic. Rather than focusing on the latest and flashiest techniques for image replacement or cross-browser rounded corners, it is concerned with improving the performance of your website (both for your users' and your organisation's benefit), making it easy for newcomers to teams to easily comprehend and add to existing code and for CSS within your infrastructure to be considered from the outset and built in a sane and performant manner. Antony Kennedy currently describes himself as a senior front-end engineer. He has worked on many high-traffic sites for companies such as the BBC, BSkyB, Tesco, Disney, and Channel4. He is an advocate of good processes and agile development, and writes (infrequently) about them and web development on his blog Zeroed and Noughted. He has released an album on iTunes, which is in absolutely no danger of threatening the charts any time soon. Antony particularly enjoys arguing, fixing broken processes, and demonstrating that you can be agile in a waterfall business environment. His doorbell tweets him pictures of people that ring it. He is very difficult to buy presents for. Inayaili de León is a London-based web designer from Portugal who currently works for Canonical (the creators of Ubuntu). Self-taught when it comes to web design, Inayaili has a degree in Communications Design. Working on content-heavy web applications is a challenge and a pleasure that she will happily take on, transforming what could easily look like a mess into user-friendly designs. Clean, semantic, and efficient HTML and CSS are a must when converting those designs into the Web, and it is a subject that she is passionate about. Inayaili speaks at conferences when she can and writes for 24 Ways, Smashing Magazine, and .net magazine as well as on her own blog, Web Designer Notebook. 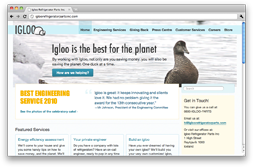 In order to demonstrate the suggestions and tips put forward in the book, an example website for the fictional company Igloo Refrigerator Parts Inc was created. In this example site, all the book's chapters are put to practical use. Photography kindly provided by Paddy Donnelly.